A new health literacy series brings cooking and exercise classes to a library near you. The rain pours down outside the central branch of the Sonoma County Library in downtown Santa Rosa. But, inside the library’s community room, the smell of leeks sautéed in homemade vegetable stock permeates the air with a warm and cozy energy. “We are lucky to have so many vegetables available in the winter,” says Nussinow as she preps a tasty-looking winter slaw. “These aren’t imported from another country, they come from right here.” The class gasps with awe when the veggie queen reveals the lovely, blush pink insides of a local watermelon radish. She moves on to describe how to clean leeks, extolling the health benefits of savory alliums. Leeks? You may be asking. At the library? Until May 2017, the answer is yes, thanks to a $30,000 state grant which provided the funding for an innovative plan of action developed by forward-thinking library staffers. 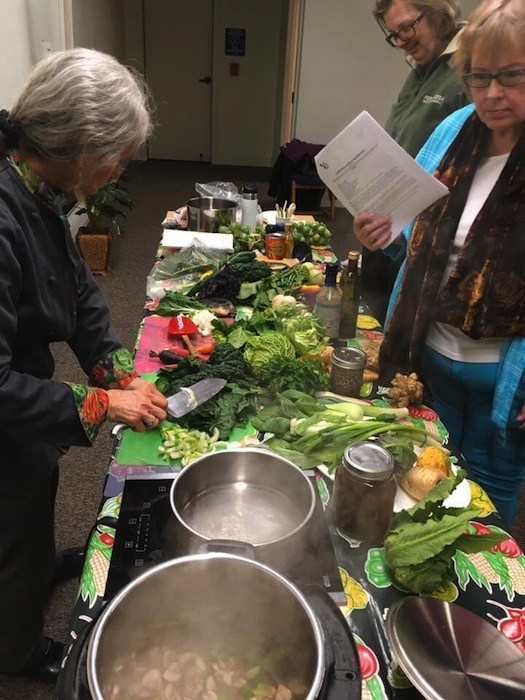 The cooking class taught by Nussinow is only one of a roster of courses offered for free, at branch libraries as part of the Healthy Living at Your Library Series. Along with cooking, from Petaluma to Cloverdale, the branches will offer free classes in Ayurveda principles, healing food basics, senior health literacy, yoga, meditation, cardio kickboxing, and more. “The purpose is to empower and equip Sonoma County families—particularly low-income households—with the information, resources, and tools necessary for healthy living,” says Jaime Anderson, a division manager with the Sonoma County Library, who also manages the health series. The feedback from the community overlapped with findings in the Portrait of Sonoma County and the 2014 Community Health Needs Assessment, which revealed deep gaps between populations when it comes to health access and food equity. The library team decided to reach out to local experts, agencies, and instructors to gauge interest about offering health literacy classes at the library. The response was positive and enthusiastic. The Sonoma County YMCA signed on to deliver fitness classes and the Northern California Center for Well-Being committed to sending out their “Promotoras de Salud” for bilingual community health education sessions. Other partners included the Sonoma County Department of Health Services, St. Joseph Health, Ceres Community Project, SRJC, and Nussinow. Despite a highly competitive grant process, the Sonoma County Library was one of 30 public libraries awarded federal grant money administered by the California State Library. The grant allows for the free classes to run through May 2017. The goals are two-fold: To increase class participants’ fruit and vegetable consumption and their commitment to regular exercise. If the enthusiasm of the audience at Jill Nussinow’s winter vegetable cooking class is any indication, at least a few people will be heading to the farmers market to pick up radishes, parsnips, and celery root. Touchdown! For registration information and a full class schedule go to sonomalibrary.org/events/programs/healthy-living-at-your-library or call your closest library branch.